City hotel market booming: Too much too fast? CINCINNATI -- The old Anna Louise Inn in downtown Cincinnati served as a safe harbor for a century. Roughly 14 months from now, it will transform into a lodging option of a different kind — a Marriott Autograph hotel, one of many new rooming projects that abound in the urban core. Since 2011, nearly 900 rooms have been added to the city center — and even more lodging options are on the way, both Downtown and fronting the opposite side of the Ohio River. That means 400 more — 600 if counting Northern Kentucky — as a building boom continues. But with the growing supply comes concern from existing hoteliers who may soon feel the pinch. While Downtown doesn't seem at that breaking point yet — both occupancy and average daily room rates, for example, increased in 2015 — the next couple of years could be critical. "I don’t foresee additional hotels being a problem," said CJ Lecky, director of sales at 21c Museum Hotel. The boutique brand joined the local landscape in 2012. "I will say that it's dependent upon how we position our city, whether we're positioning ourselves as a first tier or second tier." Cue Dan Lincoln, president and chief executive of the Cincinnati USA Convention & Visitors Bureau. The recent hotel boom, he says, is indicative of all the development that have occurred Downtown over the last decade — from The Banks to Over-the-Rhine and everything in between. Downtown had experienced a 27-year drought, with no new hotel development from 1984 to 2011. Given that fact, the current market, he said, is "explosive." "Cincinnati's finally kicked into high gear," Lincoln said. "The city's just on a roll. The skyline, the amenities have evolved dramatically in the last 10 years. More visitors means more vibrancy, more vibrancy means more people Downtown, and if it's done right, it builds upon itself." That momentum has helped land events like the World Choir Games in 2012 (more than 50,000 hotel room nights), the 2015 Major League Baseball All-Star Game (more than 16,165 hotel room nights), and the recently announced African Methodist Episcopal Church conference, which equates to 27,000 hotel room nights when it rolls into town in 2024. "Two years ago (the hoteliers) were panicking. They thought this increased supply was going to kill their occupancy," Lincoln said. "But we've changed a lot of our strategies in how we market and position our city, and that's been very successful. There's a fine line between creating new amenities, new hotels, and displacing the existing demand. You've got to do it right. "Those (events) are game changers," he added. "They tend to change the way we're seen, not only externally, around the country, but by ourselves." But there are issues still to be addressed — items that could loom large in an effort to keep rooms filled. Expanding footprints at U.S. Bank Arena, the Duke Energy Convention Center, even the Millennium Hotel, for example, are high on the list of to-do's. "Any analyst will tell you we're fighting above our weight class given the size of our (convention) center," Lincoln said. "We're pulling more business than we should. We're building demand, so you have to provide the key infrastructure. "I think we're at a crossroads," he added. "If we address these key infrastructure needs, if we find a way, the market is going to go up significantly. It's going to build faster and bigger. But if we don’t start resolving those issues in the next couple years … we can expect to see a reversal in our numbers." Looking to stay Downtown? The city center has roughly 3,300 lodging options to choose from now — 30 percent more than in 2011. And demand seems to have matched. Lincoln said occupancy rates have held steady in that span. For 2015, that number was 59.6 percent, or 4.6 percent higher than the year prior. The average daily room rate – $151.72 – was also up 3.1 percent. Regionally, Lincoln said the CVB is projecting a 3-4 percent overall increase in occupancy for 2016, although that number will vary widely by hotel. While a few hotels have renovated to keep pace — Hilton Netherland underwent a $10 million rework in 2013, and the Hyatt Regency also completed a $23 million project in which all 486 guestrooms were fully refurbished and five were added — new construction also hasn't slowed. In addition to the Renaissance Cincinnati Downtown Hotel (2014), Homewood Suites (2015), Hampton Inn & Suites (2015) and the 21c (2012), there's a handful of other projects in the pipeline, which will add 400 more rooms to the city's core. Another 228 rooms are slated in Northern Kentucky. A six story, 117-room Holiday Inn is being built at the northwest corner of Seventh and Broadway streets. It's the first new hotel building Downtown in more than 30 years. 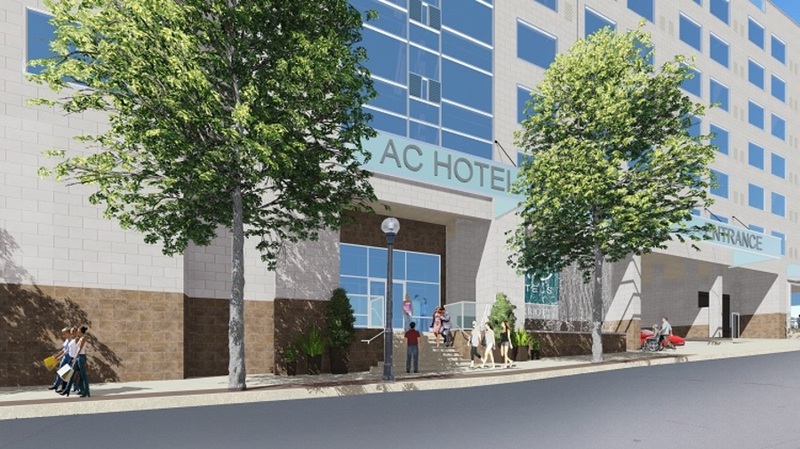 A rendering of the AC Marriott Hotel at The Banks, a 171-room development set for a spring 2017 debut. A 171-room AC Marriott Hotel is set for a March 2017 opening at The Banks. And another Marriott brand — the Autograph Collection, a premier five-star boutique — will transform the former historic Anna Louise Inn. Building remediation started in December; the 106-room hotel is expected to open next July. While not Cincinnati-sided, Hotel Covington will open this summer. And at Newport on the Levee, there will be an Aloft hotel, part of an $80 million expansion project there. That's slated for a June 2017 debut. Each project will add 114 rooms, respectively. The latest additions are all smaller, boutique offerings, Lincoln said. Boutique is loosely defined as a hotel with fewer than 200 rooms, and one that serves a niche clientele. That means variety for customers. That in itself may ease some concerns, said Martin Pittman, managing director at The Cincinnatian, which had long been considered the city's only upscale boutique since it opened in 1882. The Cincinnatian, Pittman said, has not seen a drop in its occupancy even with the increased competition. While he declined to give a specific figure, he said it was above the Downtown average. "I think the market can handle it," Pittman said. "People are traveling more. The economy has turned around. The city is still in early stages of growth, and it's still a situation where all boats are rising, especially since you don't have these monster, 1,000-room hotels being developed like you do in some major markets. "Cincinnati is known as a (tourist) destination now more than just a business market, and that's helping, too," he added. "There's always going to be something for someone in this city; this is a very strong hotel community, and everybody wants everybody else to succeed." But will that ultimately happen? The Garfield Suites, a 153-room hotel located on the cusp of Over-the-Rhine, is completely phasing to an apartment complex — a move leadership said was less about its success as an inn and more about maximizing revenues. Demand for residential rentals also remains high Downtown. It's unclear what other changes will follow. "You always have one foot on the accelerator and one on the brake," Lincoln said. "It's a cycle. Right now, there's so much pent-up demand. There is no hard and fast. What's the threshold, what's the magic number? It's hard to say. But that's when market demand will self regulate." In the meantime, more work needs to be done. Local leaders have talked for years about a specific trio — moves toward a true convention hotel, involving renovations at the 872-room Millennium Hotel, which connects to the Duke Energy Convention Center; expanding the convention center itself, which last grew its footprint in 2006 and offers 750,000 gross square feet; and renovating and expanding U.S. Bank Arena. All three are "massive game-changers" for the community, Lincoln said.They're also telltale signs whether the city in general is committed to keeping pace. "The next three to five years will be critical."